“Oh, I would love to be happy but happiness keeps eluding me – however I’ve got my work and that keeps me really, really busy and I start my new job next week, which is a big promotion and I’ll get a bigger car and a lot more money, which will allow me to move into to a larger apartment in the right neighbourhood. I’m sure once all those things are in place, I’ll feel happy”. 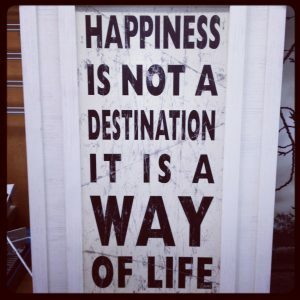 The desire to be happy is a major driving force in the way we live our lives. In fact, if we examine the reason, we do most things, it’s in the belief that it will result in making us happy. I hate my job; but I put up with it, because I need money to do the things that I love and make me happy. Doesn’t that seem somewhat back to front? How much easier would it be to work at something you love and also made you happy? If we examine what the impetus is behind our actions, maybe it can be seen to be that our desire for success, allows us to put up with all kinds of hardships. And we are prepared to suffer these hardships because we believe the end product of our toils will supply us with the things that will make us happy. Now if it is your belief that happiness will only be achieved by obtaining an affluent lifestyle, material possessions and a fat bank account, think again; ask any number of rich unhappy people if they agree. If money and possessions were the key to finding happiness, then once they were obtained, we would surely be happy. Judging by the number of stories about unhappy lottery and pools winners regularly reported in the media, perhaps there is something else. According to Dr Martin Siligman, Director of the Positive Psychology Centre at the University of Pennsylvania, an expert and author of several books on Authentic Happiness, there are three types of happiness: Pleasure, Satisfaction and Meaning. So, let’s have a look at these three areas of happiness; take a moment after reading each one to review how you score on a scale of 1 – 10, with 10 being the utopian peak of happiness and 1 equating to must try harder! Think about which areas for you have the most scope for development. How much pleasure are you feeling at this moment? How much pleasure are you registering in your body right now? Leaving aside pleasure peaks that may occur from time to time; such as, sporting exhilaration, sexual pleasure, the arts, perhaps a celebratory meal or even recreational drugs. How much aliveness are you experiencing in your body as you are reading this article? Is there enough pleasure in your life? What is the difference between satisfaction and pleasure? Probably the best way to think of it is; pleasure is something that you experience in the moment and satisfaction is the feeling that remains with you afterwards. For example, we can acquire a great deal of pleasure from eating a splendid meal, where as we gain a great deal of satisfaction from knowing that we prepared that same meal before we ate it. So, is pleasure better than satisfaction? Not at all and I certainly advise seeking out pleasure wherever you can. However, if you are seeking the long- lasting deeper feeling of happiness, that so many of us seem to crave, then pleasure for pleasure’s sake may not be the answer and perhaps satisfaction might hold the key to unlocking the door to a more profound sustaining happiness. Just imagine, it’s the end of your life and you are a guest of honour at your own funeral. All the people who love you; your family and friends, in fact everyone your wonderful life has touched are gathered there. Your best friend, who you have known since childhood steps up to recount the story of your life, the many accolades and glowing testimony of your achievements. You listen while he relays his words to the large gathering who sit in silence. As you eavesdrop on your life story unfolding, you are filled with a warm feeling of contentment and you are glad that you made the commitment to bring meaning to your life while you were alive. Hopefully you won’t have to wait until your own funeral to get the point of meaning! If you have not done so before, it’s worth taking the time to consider the question. If your life has a message, what would your life’s message be? When we look at ‘meaning’ as a type of happiness, maybe it can be said to be the feeling that sits deep inside us, the force that nourishes and nurtures the very essence of our existence. Does your life have meaning? So having examined Dr Siligman’s three types of happiness; we can see that many of the results we seek in the name of success, we are actually pursuing for happiness. Surprisingly a recent poll on what things make us happy, found that outdoor walking in nature came top, with friends, companionship and conversation a close second. So interestingly what makes us happy doesn’t have to have a huge price tag attached. One thing is for sure, you certainly can’t chase happiness; for as soon as you do, it takes flight and runs away. Maybe the secret is to accept that where you are, is where you are. Live your life from a position of gratitude and happiness, rather than for happiness; and know that at any time, in any moment, you have the choice to be and feel happy. Confidence comes from knowing that who we are and what we do is enough. It is linked to our feelings of self- esteem and self- love. It is a feeling that comes from inside ourselves and is not affected by the outside circumstances of our lives. Do you cycle regularly or maybe just occasionally? Whether you cycle daily, or just once a year, most people are confident that when they get on their bike, they will be able to balance and ride their bikes successfully. However, if you think back to when you were a child, learning to ride a bike, how strange it felt and how scary. Though, bit by bit, with courage and lots of practice, suddenly it happens, you are riding your bike with balance and a new- found confidence. Looking back to that time, I remember what a wonderful exciting and liberating feeling that was for me I hope it was for you as well. 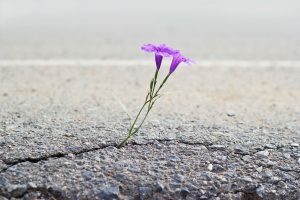 If, at the moment, you are facing a challenge in your life whether it is at work or in your private life, sometimes that challenge can seem overpowering making you feel stuck, overwhelmed and lacking in confidence and self- belief. Often these feelings can be overcome by taking a step by step approach, much the same as learning to ride a bike. When you were a child, nobody expected you just to get on your new bike and ride it first time. The same can apply equally to the challenges you are facing. Having the courage to take that first step will do wonders to move you forward, bolstering your confidence and shrinking the size of the perceived challenge to something that is more manageable and less daunting. So what is confidence and how do we get it? Let’s go back to the example of riding a bike, what is the difference between the moment just before you are able to ride your bike and the moment just after you have succeeded and come to that, any time recently that you fancied a bike ride? 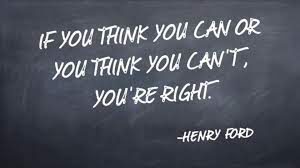 It is belief that you can do it. Now how would it be if you could have that belief, that confidence about all things that you do. Imagine how much easier your life could be and how much more you could achieve. It takes a great deal of strength and courage to feel confident when we are feeling low and full of self- doubt. However, if we are willing to trust our intuition, follow our hearts and listen to our own inner wisdom, confidence becomes the natural result; something that needs no hard work to achieve and something that is inevitable and easy flowing. Birds know when they are ready to fly, when they take their first flight from the nest, they do with supreme confidence; they do this because no one has told them they cannot. Is stress ruining your life? Would you like to take back control of your life and feel the quality of your day to day living increase? A visit to your doctor, complaining about how stressed you feel, would probably result in your doctor prescribing medication and although medication might have a place for short term alleviation medication can only ever treat the symptom and not the original cause of your stress. The secret of combating and beating stress is to remember that; – it is not the event or circumstance that causes the problem – but our emotional reaction and response to those causes. This is why you don’t need to change the world, your relationships, your job or in fact anything you regard as the source of your stress – just change the way you react to it. As you change the way you see, perceive and interpret these events, the intensity and duration of your stress response will change with it. 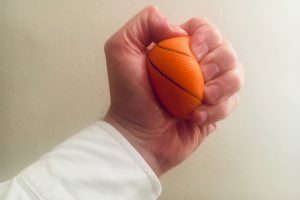 If we approach life’s challenges, its ups and downs with a flexible approach, rather than a tight perfectionist, rigid controlling attitude, we can avoid some of the major triggers of feeling anxious and stressed. After all, what do we control; the delayed train that makes us late for an important meeting; the local traffic jam that means we can’t collect our kids from school on time; the downpour of rain on our large family barbeque; what other people do most of the time? In fact, most of life is completely out of our control! What we can control however is our response to those events; the way we react to the challenges, life throws at us. Be flexible, it’s the trees that bends in the strong wind that survives the storm. Learn to adapt – life’s a lot less stressful that way. I love watching Roger Federer play tennis; for me, his athleticism, focus and sheer all-round ability make him the most exceptionally talented and outstanding tennis player there has ever been. However, as much as my praise of his tennis playing ability is unlimited, seeing him recently on TV made me think it would be best for him to stick to what he is good at. I refer to a commercial for Swiss Chocolate that I recently watched that portrayed Roger Federer’s acting prowess to be just about as wooden as a hand carved cuckoo clock from his native Switzerland! I don’t blame Federer for cashing in on his fame as a tennis star and taking advantage of what’s available to him while his flame burns bright. And certainly, if you are the best in the world at one thing, why should we presume that he would shine in all areas? I’m sure no one would expect Roger Federer, to climb into a racing car and compete equally with Formula 1 world champion Lewis Hamilton, at a Grand Prix race track. We seem to so often look at other people and admire their skills, abilities and achievements while completely overlooking our own glorious talents and strengths. Why is it we can be so completely in awe of the talents of entrepreneurs, sportsmen, television and movie stars and overlook ourselves and those people close to us, who are performing an equally brilliant job in what they do? Our modern- day media frequently highlight this dilemma and repeatedly focus on failure and an individual’s limitations, with their wonderful talents and strengths being swiftly and conveniently overlooked. When for instance was the last time you made a list of what you consider to be your strengths; rather than what seems to be an on-going process of constantly looking at areas where you think there is room for improvement? In the workplace we regularly see staff training geared to developing areas of weakness, with managers proposing training that will produce a workforce of ‘rounded’ employees, with the assumption that each person’s greatest room for personal growth is in the area of their greatest weakness. This training can certainly be useful for learning new skills but often has the outcome of producing a homogenised level of mediocrity, with the possibility for developing strengths being completely disregarded. Research measuring business efficiency within leading companies by The Gallup Organisation (Gallup poll) has thrown up some interesting facts. When asked the question: At work do you have the opportunity to do what you do best every day? The analysis showed that where employees answered “strongly agree” to this question, they were 50% more likely to work in companies with lower employee turnover, 38% more likely to work in more productive business units and 44% more likely to work in units with high customer satisfaction. What is even more surprising is just 20% of all people polled by Gallup globally, answered “strongly agree” to the question that their strengths are in play daily. Most bizarre of all, the longer an employee stays within an organisation and the higher he climbs the traditional career ladder, the less likely he is to strongly agree that he is regularly playing to his strengths. So it’s quite clear, by following the established corporate model, businesses are missing out on a great opportunity for growth and chance to add value to their organisation from within and employees are missing out on a whole lot of job satisfaction and an easy route for career success. How do we recognise our talents and make them our strengths? Probably the easiest way is to look at what feels natural to you; your talents and strengths are innate and what feels easy, instinctive and natural when doing something, can indicate where your strengths lie. So, how did I get to have these particular set of strengths? If we consider how our brains are formed and function, we can see that from a very early age, even while still in the womb, our brains are making connections. In fact, forty-two days after you are conceived you grow your first neuron, 120 days later you will have grown a staggering hundred billion of them. Then around sixty days before your birth your neurons start trying to communicate with each other. Each neuron reaches out and when a successful connection is made a synapse is formed. A synapse is a connection between two brain cells (neurons) that allow the cells to communicate with each other and it is how these synapses are woven early in our imprint years that determine in later life exactly what our talents and strengths will be. If you constantly struggle to accomplish an activity or learn a new skill, even though you have given ample time and effort to its mastering, odds are that it’s not going to be one of your strengths. A good example of this, which I’m sure we have all witnessed in some form or another, is when we hear the expression ‘He’s a natural’ or ‘She excels with no effort at all’. The chances are that someone is playing to their strengths and exploiting their natural talents. Another indicator can be found in what we like doing most; many of the most successful people around are doing what they love doing. They get the great results they achieve simply from operating in areas that utilise their talents and strengths the most. So to sum up, by recognising, understanding and utilising your talents and strengths; not only will you become more successful with less effort but you will probably feel happier and more fulfilled in the process.